With 18 separate inputs in total (and eight independent outputs), 18i8 is perfect when you need to record and a significant number of sources simultaneously. 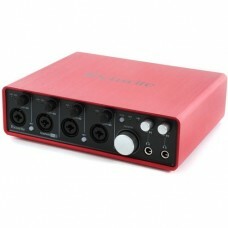 You can also expand the 18i8 for even more recording flexibility. Like all Scarlett interfaces, 18i8 is fully compatible with Macintosh® (including Yosemite®), Windows® and even iOS® (Apple Camera Connection Kit required), and, with the new Red 2 and Red 3 AAX plugins that are included in the package, it’s a perfect partner for Pro Tools®.